These really look special on a quilt and they would be nearly impossible to do freehand. For the double echoes above, start by placing the pattern you want to echo in a block. These are the next steps. Add Pattern > Echo Pattern > touch the pattern you wish to echo. Continue. Set the repeats to 2, gap to .25, smooth to 0%, gap progress 0%, points sharp. Touch the area outside the pattern. Touch finished and chose jumpstitch as the transition. Finished. Add/Edit Pattern > Add Pattern > Echo Pattern > this time select the echoes, not the original pattern, as the pattern to echo. Continue. For this example, I set the repeats to 4 and the gap to .75 then touched the area where I wanted the echoes. The echoes will spill out beyond the block so it will be necessary to create a clipping block to remove the excess echoes, just as described in the first echo post. You can see in my screenshot that I left the clipping block transition as jumpstitch (the green lines indicate that) This is a faster choice than splitting and combining but there will be lots of threads to trim away. 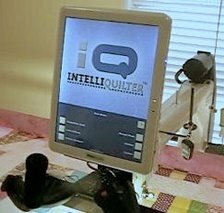 If you choose jumpstitch, remember to set iQ to do backstitches. Alternatively stop to cut threads could be chosen, but selecting continuous will create a lot of over stitching along the outside edge of the block. To find out which transition you prefer, set this block pattern up three times on a practice piece and try each transition to see which one you prefer. I would only split and combine the echoes into a different stitching path if I was working on a really special quilt. Usually jumpstitch works well because the little back stitching is hidden in the seam ditch of the block. This same method can be used to create triple echo lines or any number you please. Set the initial echo repeats to what you want. You must touch finished, not accept, on the echo pattern page even though you want to place more echoes. This is because you need to choose a different pattern to echo.